What is the cost of living in Luxembourg? Known as the Green Heart of Europe, Luxembourg is a small country of many treasures. Despite the challenge of being a small independent state, confined between somewhat intimidating European powers, the country has proven itself as an economic and political giant in its own right. The world’s remaining grand duchy, Luxembourg is an unmistakable hodgepodge of culture, art and history – a mixture of Romanic and Germanic Europe with a fairy-tale-like sensation. But Luxembourg is not just known for its green beauty. It is one of the founding members of the European Union and has been a strong advocate of economic and political integration in Europe. It is also the only European country to be granted the title of ‘European Capital of Culture’ twice. Although the country has limited land area and a small population (549,700 as of 2013), it has the highest GDP per capita in the world at $111,162 (according to the World Bank), as well as the third highest gross income among OECD countries (at $52,639 in 2012). Such an attractive image is perhaps one of the reasons why a huge percentage of Luxembourg’s population is foreign nationals. According to Statistiques de Luxembourg, about 248,900 (45.3%) of the total population of 549,700 are foreigners, 5,900 of whom are British citizens, comprising about 1.07% of the total population, or 2.37% of the foreign population. 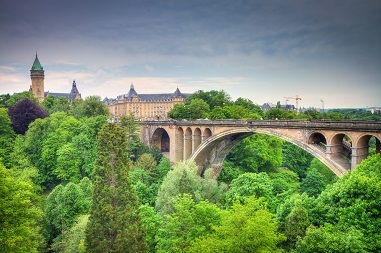 Most expats can be found in the heart and capital of the country, Luxembourg City. It is the political, economic and cultural centre of the nation and has developed to be its banking and finance district (banking and finance are Luxembourg’s main industries). With its historic buildings and ancient fortifications, the city itself is on UNESCO’s list of World Heritage Sites. Mercer’s Cost of Living Survey for 2014 ranks Luxembourg as the 56th most expensive city to live in – tied with Brussels and behind London (12th), Stockholm (38th) and Dublin (51st), but above Berlin (68th) and Warsaw (142nd). This week, AES International looks into the Green Heart of Europe. The city of Luxembourg is divided into 24 quarters, each appealing to different types of residents. Host to some EU institutions such as the European Parliament, Kirchberg in the northern quarter is a popular location for expats who work in the EU, and is therefore expensive. Other expensive districts are Belair and Limpertsberg (in the west) because of their proximity to basic services and landmarks. On the other hand, Cessange (in the south) and Hamm (in the east) are some of the quarters that offer less expensive housing, with the latter being popular to expats because of its nearness to St. George International School. However, aircraft noise in these areas is prevalent. Accommodation is much cheaper in Bonnevoie (in the south) and Eich (in the south). Most single expats prefer Grund and Clausen in the central quarter as these areas provide an abundance of choice of lively pubs, bars and restaurants, but accommodation costs can be quite expensive. For expats with families who would prefer to settle in green neighbourhoods where there is an abundance of family-oriented services, Merl can be a good option. Renting versus buying is a common expat dilemma when moving to a new country. If your stay in the country is only for a foreseeable period, renting might be the best option. But if you are planning to settle in Luxembourg for good, especially if you have already spent a few years in the country and have decided to reside in the city permanently, you should seriously consider buying a property. Expats should expect to spend a large portion of their income on rent. A 1-bedroom apartment in any of the expensive districts (Belair, Limpertsberg and Kirchberg) can easily cost EUR 1,200 whilst 3-bedroom apartments cost EUR 3,500. In the more modest quarters (Bonnevoie and Eich), a 1-bedroom apartment can be rented for EUR 700 per month, whilst a 3-bedroom one costs EUR 1,500. Rental contracts in Luxembourg are usually for one year, but others offer two-three year contracts. Landlords will also require a deposit of one to three months’ worth of rent. Buying a property is a good option for expats considering living in Luxembourg for a long time. Around 75% of the population own their own homes. In the expensive districts, expats should expect to spend as much as EUR 500,000 and EUR 1 million for 1-bedroom and 3-bedroom apartments, respectively. On the other hand, the same property can be bought for EUR 350,000 and EUR 800,000 in more modest areas. Naturally, houses cost a lot more, and expats should expect to spend at least EUR 200,000 more on such accommodation. Housing prices in Luxembourg City are among the highest in Europe, and banks and financial institutions have responded by increasing the length of mortgages from 20 years to 25-30 years and covering as much as 80% of the property cost. Buyers should make a deposit of around 20%-25% of the property price, and mortgage rates are around 2% per year. Other fees include the annual property tax (1%-8% of the purchase price), transfer tax (6%), transcription tax (1.2% of the market value), and notary fees (1.5%). The cost of utilities in Luxembourg is slightly more expensive than some of its European neighbours, such as the UK, Germany and Belgium. On average, an expat would spend EUR 150 per month on utility costs in Luxembourg, which include electricity, water and heating. These are paid every two months. Expats might have to apply for electricity and water accounts at the Luxembourg Energy Office. Expats will also find a lot of great deals in Luxembourg for their mobile and Internet needs. Some of the major telecommunications providers in the country are P&T and Orange, with the latter having monthly offers of unlimited calls and text, with 10GB of mobile date for EUR 33 per month. It also has a 20Mbps DSL offer of EUR 28 per month and a package of home Internet, cable TV and landline for EUR 50 per month. The cost of regular market goods in Luxembourg is similar to some European cities such as Berlin and Sweden, but is slightly less expensive than in London and Zurich, although the cost of monthly groceries can still be more expensive than your home country if you are more selective in your food choices. A single expat can easily spend EUR 300 on monthly groceries, and a family of four can afford different kinds of food on EUR 700 per month. Expats will also find some local goods to be less expensive than imported ones. To see more effectively the difference in food costs between European cities, we have been comparing the cost of a Big Mac and a Starbucks Grande Latte in each location. The price of each is (for once) on a par with other European countries. The city’s small size makes it easy for individuals to travel across towns and even countries in a short span of time. It has a comprehensive and excellent public transport network comprising buses and trains: there is an integrated ticketing system that can be used for each. Tickets allow commuters to travel freely without limit for a day (EUR 4) or a month (EUR 40). There are also short-term tickets with a validity of two hours for EUR 2. Taxis, on the other hand, have a normal flat rate of EUR 2.50, with a 3-km ride costing EUR 10. The cost of petrol in Luxembourg is less (at EUR 1.30 per litre) than some European cities, such as London, Brussels, Zurich and Stockholm, and so are car prices. For example, a Honda Civic (EUR 17,100) and a Porsche Carrera S (EUR 87,800) cost around EUR 4,000-6,000 less than London prices (EUR 21,600 and EUR 93,400, respectively). With the relatively higher prices of cars and the efficient public transportation systems, commuting might be a better option for expats. Luxembourg puts a high priority in education, which is why it is one of a few countries with 100% literacy rate of those aged 15 and above. The majority of the population is also trilingual as the country has three official languages and all are used in schools: Luxembourgish (the national language, or mother tongue), French and German. Students must be proficient in all three languages before they are allowed to graduate. As in most countries, education in Luxembourg comes in three forms: state, private and international. State schooling allows for free education and parents would not have to pay for tuition fees. Public (state) schools also provide an education allowance to students aged 2-8. This is the best choice for expats who plan to stay in the country for a long time. Expat parents who want their children educated under their respective countries’ curricula often choose private schools and international schools, which can be expensive. Most private and international schools use the International Baccalaureate, although some cater to specific needs of different nationalities. A popular private school, Waldorf School Luxembourg, charges around EUR 5,000 per year on tuition fees, with increasing discounts as the number of siblings enrolled in the school increases. Some of the most popular international schools in Luxembourg are St. George’s International School (EUR 6,200 for preschool up to EUR 14,200 for teenage years) and the International School of Luxembourg (EUR 11,700 for preschool up to EUR 18,115 for teenage years). There are also other fees to consider such as the application fee, building fund and stability fund. Luxembourg’s healthcare system provides free basic healthcare to all its citizens and 98% of the population have access to its public healthcare system. The public healthcare system is financed through collections made by the Caisse de Maladie and put under the National Health Fund or Caisse Nationale de Santé (CNS). Employed individuals must pay monthly contributions, normally 10% of salary, half of which is paid by the employer. Self-employed individuals make their own contributions and the amount depending on their profession. These contributions cover childbirth, rehabilitation, hospitalization and medical prescriptions, and patients can choose the hospital or doctor to treat them. However, patients must pay up front for medical treatment and can later recover 80%-100% of the total costs from the CNS. Dependents of the contributor are also covered by the system. Private healthcare, on the other hand, is mainly supplemental and some employers provide private healthcare as part of employee benefits. As a general rule, private health insurance pays for services that not covered by public healthcare. Luxembourg is a cosmopolitan city where expats from all over the world find the city’s entertainment abundant. Simply walking along the streets of the city is like taking a journey through time, with its towns and fortifications being a parade of the country’s past. Those fascinated by history should never miss a trip to the National Museum of History and Art, showcasing 18th to 20th century Luxembourgish art, especially the works of Joseph Kutter, Nico Klopp and Auguste Trémont (EUR 5). Another museum of interest is the Museum of the History of the City of Luxembourg (EUR 5). Expats who prefer the theatre and opera should visit Theater des Capucins (EUR 8-25), Grand Theater de la Ville de Luxembourg (EUR 8-35), and Conservatoire de la Ville de Luxembourg (EUR 8-25), which all have a variety of shows all year round. If you want to take someone out on a date, a meal for two in an mid-range restaurant can cost around EUR 70 or more depending on your food choices and alcohol consumption (a bottle of local alcohol costs EUR 3), and going to the cinema costs around EUR 17 for two. Other forms of entertainment that do not require fees are the festivals and events that take place along the streets of the city, such as the National Day, when the Grand Duke and his family hold a parade in the city; and Summer in the City, a three-month celebration with street theatre, open-air cinema, and markets, amongst others. With its fairy-tale-like feel, expats may find Luxembourg City quite different from their typical European urban life. It is a treasure trove of history, art and culture, where ancient fortresses blend with contemporary architecture and the relaxing view of greens and nature contrast the bustling of the city. But it is not just the green landscapes, the Casemates, the fortresses and the soothing view of cosy towns that make Luxembourg a desirable city. It is also the high quality of living, overall wealth, and the general disposition of Luxembourgers, who are known to be hospitable, tolerant and friendly, that make the city an ideal place to live in. Its colourful history has also made it keen on establishing good political relations with its neighbours. Business people would also find the city to be a financial heaven, where banks and financial institutions can be found left and right, and the tax system favourable (the country has the lowest VAT in the EU at 15%). Luxembourg can be an ideal home, but as we always say in our Guide, a financial assessment should be your first priority before making drastic moves. With the high quality of living at a relatively lower cost (at least compared to other European cities), it is but prudent to calculate your financial capability as well as overall preparedness.